Rove says the excitement surrounding Palin will wear off. (CNN) - His insight guided both of President Bush's successful White House bids, but aides to John McCain might just be hoping Karl Rove stops talking. Days after the prominent Republican strategist said the latest McCain campaign ads had "gone too far" and failed the "100 percent truth test," Rove told the Associated Press Wednesday he thinks the choice of Sarah Palin was a political one and that the excitement she has generated will soon wear off. "Nothing lasts for 60-some-odd days," he told the Associated Press. "Will she be the center of attention in the remaining 48 days? No, but she came on in a very powerful way and has given a sense of urgency to the McCain campaign that's pretty remarkable." Rove also described the choice of Palin as a "political pick," and said she was not the most qualified Republican McCain could have chosen. But Rove also said Joe Biden, who has spent three decades in the Senate, was also a political pick - designed to make up for Barack Obama's relatively short resume. "I think the American people have deep and persistent doubts about the readiness of this dynamic and charismatic first-term senator from Illinois," said Rove. Rove's comments also come days after he wrote a column in the Wall Street Journal advising Barack Obama to stop attacking Palin directly, noting past attempts by Democratic presidential nominees to attack the No. 2 on the GOP ticket have largely fell flat. “It's a match-up he'll lose," Rove writes Thursday in his regular Wall Street Journal column. "If Mr. Obama wants to win, he needs to remember he's running against John McCain for president, not Mrs. Palin for vice president." Rove also told the AP Obama is an "arrogant dilettante," but continued to offer the Illinois senator advice on how to win the election: "The way that Obama can win is by explaining, expounding on who he is." YOU gave us G W Bush, the worst (at least the dummest) leader the free world has ever known. Want to do something for your country for a change? Vote Democratic and keep your big mouth shut! I need a bath just from LOOKING at that guy!! Maybe he'll join Team Obama? Maybe it's the rat trap Karl Rove is setting. Don't like it a bit. Firstly, Rove belongs behind bars for committing treason by divulging the secret identity of a CIA operative for political purposes and undermining the work Agent Plame was involved in with preventing Iran from acquiring nuclear weapons. Since Rove dropped her name, conditions have become progressively more dangerous in the area of potential Iranian involvement in nuclear proliferation and development. Secondly, anything Rove has to say about this presidential race, of course, should be seen as the same strain of calculated, propagandistic drivel that he and his cohorts at Fixed Noise are so adept at disseminating. It's a setup. I DON'T BELIEVE A WORD OF IT. Rove is a pathalogical liar. He is in cahoots with the AMERICAN ISSUES PROJECT – the ones that SWIFTBOATED John Kerry. They are geting ready to launch their attack. Obama is ready. He is one step ahead. Rove is right about Obama's choice of Biden as a political pick, but you know what?? THere is a big difference in his "political pick" and McCain's "political pick" ... Obama's choice of Biden will help him and the rest of the country and is good for both of those while McCain's choice of Palin is only good McCain and not at all good for the rest of the country (heck even Chuck Hagel said today that he doubts Palin is ready ... he hasn't said anything like that about Barack). Uh, Karl, It has already happended. Karl is such a nice man. Of course Obama picked Biden for his experience and knowledge of foreign policy and the economy. Obama should be using the saying Country First. If something should happen to Obama, Biden could take over on Day One. Obama was thinking of the U.S. 1st and what would be best for it. He could of taken the political way out like McCain and picked a no nothing, no experience, wacky women like Palin too just to get more votes. And no one can say Obama didn't vet Biden. Can you say the same for McNuts. Who nominates a person for VP who is presently under investigation for abusing their powers as Governor, whos family life has low morals and who doesn't even agree with the policies you plan to put in effect as President. Both McCain and Palin are an insult to the women in American.. Do they really think we are so dumb that we don't see right thru this lie. Amendment to my previous response: Rove is right about PALIN, WRONG about Obama! Rove calling OBAMA arrogant??? PLEASE! OBAMA and BIDEN will win by a landslide. People see through picks like Palin in a heartbeat. Louisiana and Arkansas, nobody is talking about these two states. Arkansas is Clinton/democrat territory and Louisiana got hit hard by two or three hurricanes that the GOP did little about. I think those two are going to be Democrat blue this year. I think you need to get your facts straight. Obama has sat down with friendly and hostile interviewers, including the likes of Bill O'Reilly. When McCain or Palin sits down with Rachel Maddow or Keith Olberman, come back to me. Good luck with your misinformation and distortions! Excitement is not evrything, it is only emotion, and we cannot trust our emotion whether it is for Obama or McCain. The real question is experience, ability and character. We are asking the same questions about all candidates, especially Obama who is running for the highest office in the land, or the most powerful position in the world, a dangerous world. She was a risky gamble from a failing campaign. She is a gimmick, nothing more. Don't tell me she was picked for her qualifications, that's absurd. Yes, it is reasonable to questions Obama's readiness too... that's fair. But to say she is more qualified is just stupid. Attacking Obama, is not a sufficient answer to questions regarding her qualifications. It is a clear sign that Johnny McCain does not put our country first, he puts himself first. Karl, don't you and Palin have a few subpoenas to comply with? The Palin "Excitement" is more like watching a train wreck. Why is this guy still relevant?? As much as I hate to say this, but I think Rove is a "Closet Obama Supporter". He is a political mastermind, and enjoys the strategic maneuvering. I think he is really enjoying the cat-and-mouse game both campaigns are playing. Too bad he is a scumbag. I do give him credit for electing a dud twice in the White House. 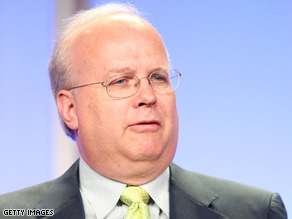 "she came on in a very powerful way" Rove did you mean she came on in a very lying way. She was only doing what your and McCain told her to do, and of course READ what she was told to read. Wait, to my understanding SHE was a GREAT liar in Alaska..........WAIT a minute is that what you are trying to say Rove, this is the reason you and McCain picked her, that EXPLAINS IT!!!!!!!!!!!!!!!!!!!!!!!!! You can't buy integrity Rove. Someday you will look at the faces of the millions of people you hurt and want a good legacy. Too bad, it's in the toilet, along with any semblance of respect for you, or your offspring. For generations the name Rove will be synonymous with treason. I don't trust Rove as far as I could throw him. Whatever he says, take with a grain of salt, and then some. If it walks like a ......, and talks like a ......., it MUST be a .......! What ever happened to that SUPOENA, anyway ??? NO WAY, NO HOW, NO MCCAIN-PALIN !!!!!!!!!! McCain speech – every time they chant their name or USA USA USA, they"re covering up the people who are heckling. What a shame our right to freedom of speech will be gone if "avoid subpoenas" McCain/Palin get into office. The idea that Pa-Lie-N could be the president has scared the truth out of Carl Rove, he is willing offer Obama free advise in hopes of preventing that from happening. Cindy keep your eyes on John, he has his eye on Palin and she has meet his qualifications. The Republicans have to be pulling their hair out. Thank you Pa-lie-N, for helping the democratics. OBAMA 08, OBAMA NOW! I agree with Karl Rove perhaps for the first time but, I can see why the Sarah express is going to get derailed – SHE WON'T STOP LYING! OK, sometimes, it's just exaggeration or just plain ignorance but the rest of the time it's just plain old lies!